Here’s the update on the bread–with photos! The JTB bread turned out pretty good, although it (as usual) tends to rise in the middle to form a dome-shaped loaf, no matter what type of pan it goes into. 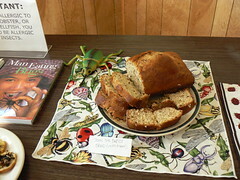 I also made Banana Chocolate Chirpy Bread–basically a banana bread mix with cricket flour and chocolate chips in it. That was also a pretty big hit. Both of these are stealth entomophagy–while the odd head capsule may escape conversion into flour, or leg poke out of a slice, for the most part, you can’t see the insects. It’s where most people start. 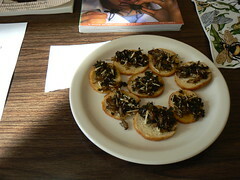 What was really surprising is how many people liked the foods I brought that didn’t try to hide the bugs. The pesto cricket canapés went over very well! I froze a lot of pesto last summer, and had about half a jar left over from earlier this week. I threw some crickets in, put it on bagel bites, and they were eagerly gobbled up. I also fried up waxworms in garlic butter, and those were very popular as well. (Served on a Triscut for a nice crunch). So, the usual results–I always say I’ll never do bug food again, since it is a huge hassle to cook for 50+ people, but I have so much fun I get suckered into doing it again. We also had wonderful conversations about what is “normal” and food-animal conversion efficiency, so the basic message definitely got through! Eating insects is ecologically efficient, and culturally the norm in most of the world. Actually, mealworms on pizza is pretty good–I grind them with falafel mix for a sort of beetle-sausage pizza. I’m under the impression that in most cultures where bugs are eaten it’s a gathering-in-the-wild operation rather than farming. Could a serious mealworm or waxworm farming enterprise turn out protein that would be cost-competitive with chicken or beef? In other words, is entomophagy sustainable and economically practical on an agricultural basis? If you did it as a grow-your-own, or a local enterprise, then yes, it could be sustainable on an ag basis. Mealworms are quite easy to rear, and cook up nicely. Many folks in Asia rear their own insects for both food and pets. I gotta ask….do you eat those recipes? Yes! I ate a little of everything. If you mean do I cook like this regularly, no. But I tend to not cook in the winter at all, really.